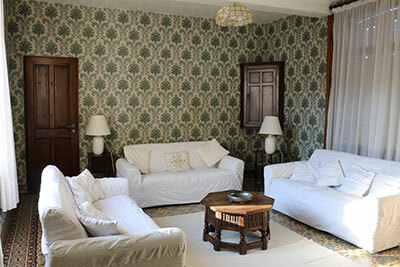 The Salon is furnished with three large sofas, a coffee table and two chairs. 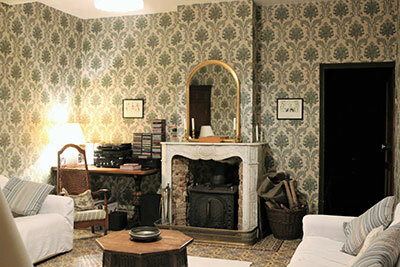 There is a stereo record player, CD player and tape deck with a large and eclectic selection of records, tapes and CDs. 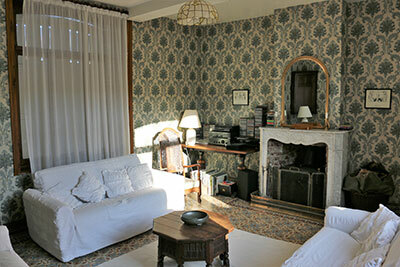 It is a great place to chill out with a book and listened to music with a glass of something or just to sit and chat, especially in winter when the wood-burning stove is lit. 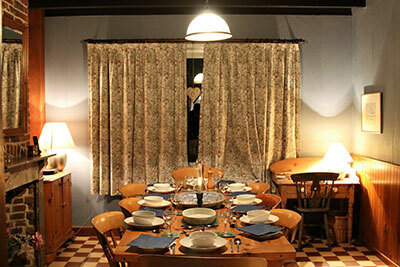 The Panelled Dining Room has a great ambience in which to enjoy good food and wine. 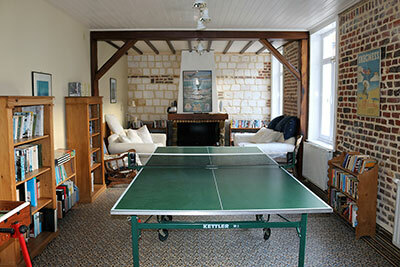 It has a large pine table, eight dining chairs, and an antique pine dresser full of games. An additional table, chairs, and a child's high chair are available if needed. 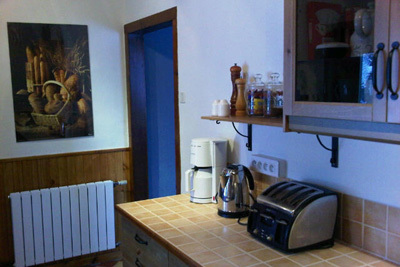 The Kitchen is a foodie's paradise, described by one of our visitors as wonderfully over-equipped. 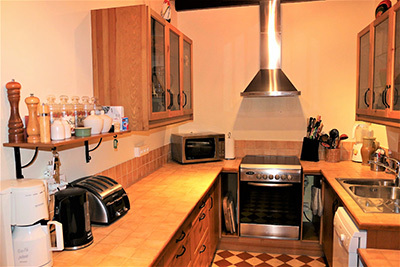 There is a cooker with an electric oven and gas hob, a large fridge/freezer, dishwasher, microwave, blender, kettle, toaster and coffee machine. With a wide selection of pots, pans and utensils, including two fondue sets, the essential oyster opener and foie gras cutter, cooking is easy even for a large group if you are preparing meals with the excellent ingredients to be found in our local shops and markets. 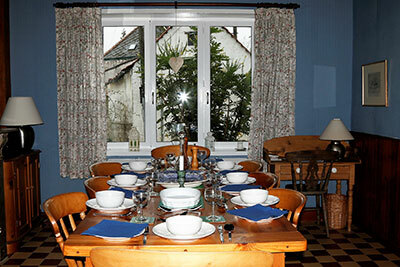 The kitchen door opens on to a terrace (a sun trap for breakfast) and the garden. 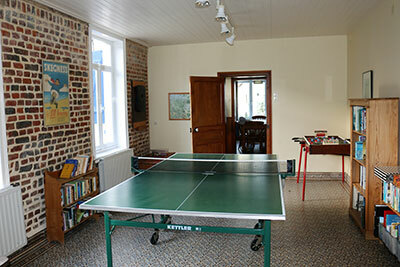 The Games Room has a full-size table-tennis table, table football, jigsaws, games, TV with video and DVD player. There is no external TV reception (although there are more videos and DVDs than you could possibly watch in even a lengthy stay). Our visitors have commented that this encourages everyone (including teenagers) to become engaged in all the activities available at The Farmhouse. Although if you wish you can plug in your laptop for streaming to avoid missing your favourite sport. One bookcase is devoted to the history of the area with an extensive library of WW1 and Hundred Years War reference books, regional guide books, walking routes, and maps. The other bookcase contains a full range of holiday reading. There is a sofa and a double sofa bed. The Cellar opens off the hall and is useful for keeping wine, really smelly cheeses, and other food cool. The Shower-room and separate WC are both wheelchair-accessible. 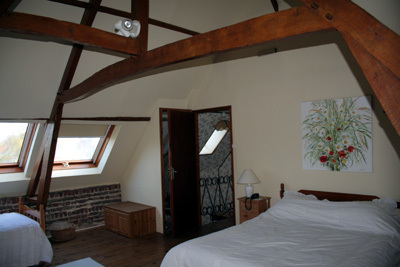 There is a separate additional bathroom, all with heated towel rails. The Laundry Room opens off the bathroom. It has three washing machines (yes, really! 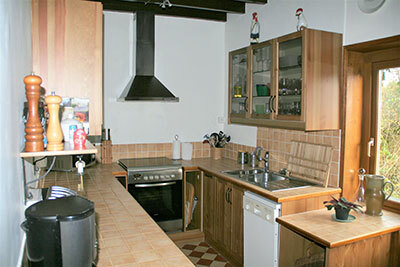 ), two tumble dryers and an extra fridge. 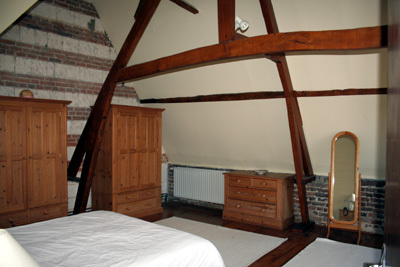 The Master Bedroom has a king size bed, an extra single bed at the side of the room, bedside tables, two pine wardrobes (with the largest collection of hangers in northern Europe) and a chest of drawers with a hairdryer. It overlooks the garden. 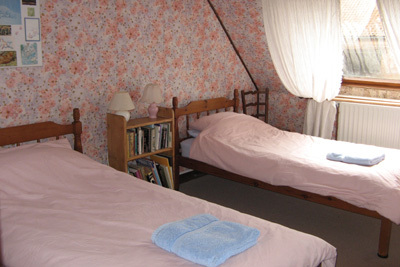 The Pink Bedroom has twin beds, a bedside table, and a pine wardrobe. 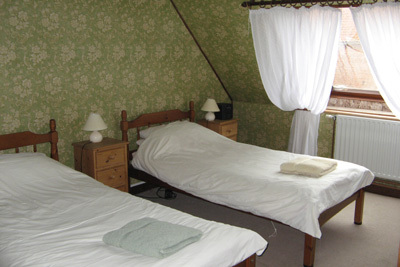 The Green Bedroom has twin beds, two bedside tables, and a pine wardrobe. 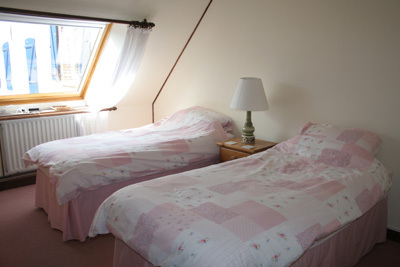 What we call the Children's Bedroom has full size twin beds, a bookcase, a small pine wardrobe and a chest of drawers. 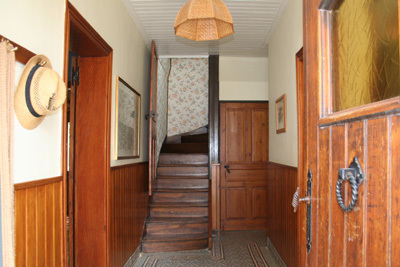 All three bedrooms overlook the courtyard. The upstairs Shower Room has a radiator/heated towel rail. There are two separate WCs with wash basins. One of these has storage space containing a Z-bed, electrically- inflatable single beds, 2 travel cots, a child's high chair and a low chair. There is also as an ironing board and iron. Telephone and Wi-Fi There is a telephone and fax machine in the dining room and a telephone in the master bedroom. 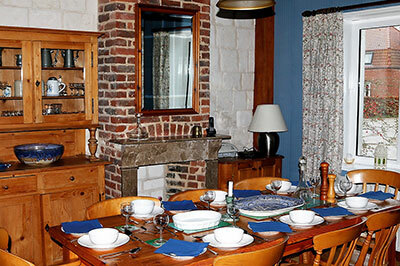 There is free Wi-Fi reception in The Farmhouse. Smoking policy We do not permit smoking anywhere in the farmhouse or barns. If you wish to smoke in the courtyard or garden, please tidy away any cigarette butts safely.